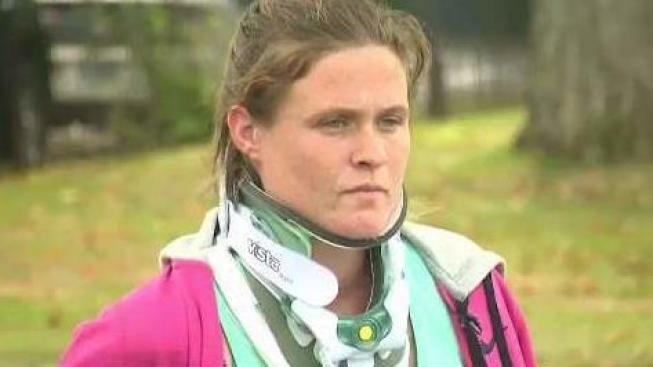 A New Hampshire woman, whose husband allegedly ran over her with a car, is speaking out about the horrific ordeal for the first time. With a broken collar bone, broken hand, and a broken heart, Saturn Alleyne recalled the worst day of her life. “I just remember I couldn’t die that way, I wasn’t going to die right there, I couldn’t,” she said. Last Monday afternoon, she and her husband, Jason, got into a fight. Alleyne says he followed her to a Bow gas station and threatened to kill her. “I remember being scared and just running,” she said. That’s when police say Jason got into her car, pulled U-turn, and headed straight for his wife. She remembers the moment he hit her. “I couldn’t breathe, I couldn’t talk, I couldn’t move, I couldn’t get the car off me,” Alleyne said. She was pinned under the car and could only think of one thing – her daughters. Five men came rushing to help and lifted the car off of her. “I would love to meet them because without them I wouldn’t be here,” she said. Alleyne says her happy marriage took a dramatic turn when she and her husband started using crystal meth. She says over the last year, the abuse was every other day. “Whether it was a push, a punch, a hit, or a spit,” she explained. But she never imagined this. “How could he do this? I don’t understand,” Alleyne said. But in some ways Alleyne is thankful. She is now clean and says this kind of clarity doesn’t come without tragedy. Alleyne has made a promise to her family to stay clean and spend the rest of her life teaching her girls the importance of respecting themselves. As for Jason Alleyne, he’s charged with attempted murder and is being held on $100,000 cash bail. Anyone who would like to help Saturn Alleyne and her family get back on their feet, can go to a YouCaring page set up for them.